Lin Tianmiao was born in Taiyuan, Shanxi in 1961. After graduating from the Fine Arts Department of the Teachers’ Training University in Beijing in 1984, she left for America to further her studies. In 1989, she graduated from the Art Students League in New York and spent the next seven to eight years in the city. Lin’s sojourn in New York allowed her to absorb the creative energies of the sprawling urban setting while she worked as a fabric designer. Almost a decade later, her husband and she decided to return to China, settling in Beijing where they set up their art studio. 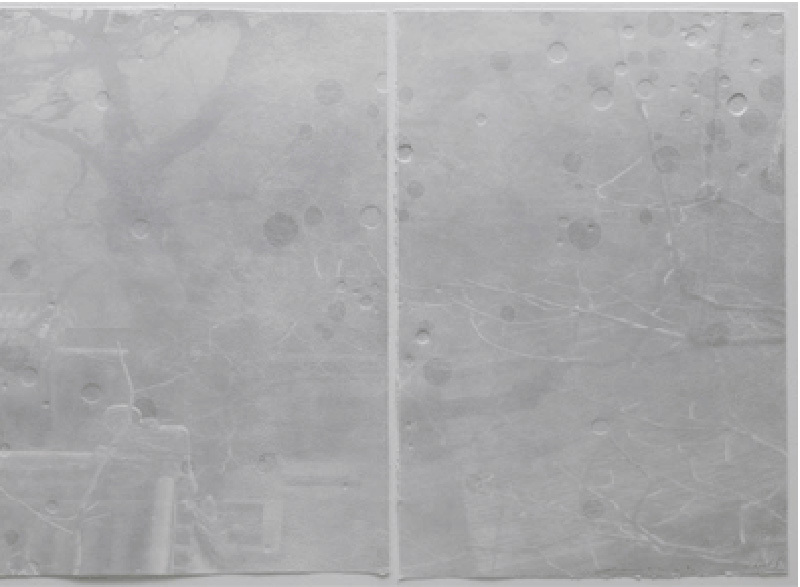 In no time, Lin became one of the most closely-watched female artists of Chinese contemporary art in the new century. In 1997, Lin Tianmiao presented an exhibition titled, ‘Bound Unbound,’ at the Gallery of the Central Academy of Fine Arts in Beijing, which incorporated the use of the characteristically feminine material of cotton threads as the medium of her creative work. This exhibition shot her to fame, and “thread” became a distinctive creative symbol in her work. Lin’s artistic choice of cotton thread stems from her personal experience that as a child, she used to help her mother make cotton thread balls, often standing for a whole hour. In China at that time, these white cotton threads were popularly used to make blankets, woolen jackets or gloves. After her return from the USA, while visiting a factory Lin chanced upon the same cotton threads – an object deeply impressed in her memory – and was thus inspired to use them as creative medium. For Lin, the functionality of thread represents a force which can turn things useful into useless (and vice versa) resulting in transformation of their value – it possesses both creative and destructive energy. Ultimately, the very symbol of thread bridges the real and the surreal. According to Lin Tianmiao, a “line of thread” is both sensitive and sharp; it illustrates and alters gender or status while serving as one of the features for feminine aesthetics. Furthermore, it reflects the processes and changing conditions which she goes through as a woman. In fact, the practice of creating work with cotton threads often makes her calm but that process itself marks her renewed acquaintance with traditional culture. In the end, cotton threads have infiltrated her innermost being and the complex, multidirectional architecture of her mind, such that other visual vocabularies and explorations in her works seem to fade in importance. Since ancient times, female artists in art history have been marginalized, sometimes even totally neglected. The Feminist movement of the 1970s in the West aroused in women the awareness of their feminine status, and made far-reaching impact on many female artists in the West. In the past, the role of man as the viewer – designated as the “male gaze” – was taken for granted, while women were regarded as the object of viewing. Now that female consciousness has been awakened, women artists have learned to use the female gaze as the momentum behind their creative perspective and artistic choices. Female subjectivity naturally became an important stance for female artists in their creative activities. Women, having gone through the experience of women’s liberation, no longer need to exist as objects of viewership upon facing their own bodies. Consequently, female artists have further affirmed the value of their own experiences in life. This has resulted in many women artists employing familiar knick-knacks in their everyday lives, especially materials related to household chores such as needles and threads, incorporating them in their art work. The new generation of female artists of the late 1990s has taken an even further step by integrating their individual experiences in life with the realm of performances or ceremonial modes, to explore how their works interact with human psyches, behaviors and environments. They emphasize the ritualistic significance inherent within their artistic medium; they do not use it as a base for constructing rituals. This approach which seeks to indirectly ritualize art work demonstrates the inclinations of the female artists of the new generation towards a greater degree of concern for their individual existence. As a pioneer in the Chinese feminist art, Lin Tianmiao, in her persistent course of experimentation with various mediums and artistic expressions, has illustrated the whole process of the feminist art creation from the stage of liberation to discourse. As members of the generation of women with feminist thinking, Lin Tianmiao and her contemporaries have transformed the traditional role of women as objects of manipulation and performers to persons who are masters of their own fate and directors, highlighting the will to autonomy in this new generation of female artists. Taking nature as a platform for their rituals and placing themselves in its ritualistic scenario, these artists transform the energy of nature into individual creative media; they successfully display the magical powers of “Mother Earth”. Enchantment and mystique are the common characteristics of this group of female artists. ‘Braiding,’ Lin’s 1998 work, features a near 4-meter photograph of her portrait hung up high with white threads running down from the back of the canvas all the way to the floor. In 2002, her collaborative work with husband Wang Gongxin for the Shanghai Biennial exhibition, ‘Here? or There?’, is a typical example of her oeuvre. Another solo exhibition ‘Non Zero’, which was exhibited in Beijing Tokyo Art Projects in Beijing in 2004 consists of a series of five works titled ‘Chatting,’ ‘Procreating,’ ‘Initiator,’ ‘Endless,’ and ‘Slumbering.’ The body of a woman, wrapped in white silk, stands erect with white silk threads on her head, symbolic of a veil of flowing white hair, the end of which is held by a frog on the floor. Then there is a photograph of an obese woman with egg-like objects of various sizes scattered around her. In addition, there are six women in a circle, with slightly protruded abdomens, who seem to be waiting for something. Three thin men stand near them looking aimless. The floor is strewn with cotton balls, beside it stands a baby’s cot with the spring of its mattress exposed. On it lies a baby and some white silk thread balls. Enhanced by visual and auditory effects, the entire installation created a mysterious and strange atmosphere for the audience. Lin Tianmiao’s work, whether in the form of a painting or a photographic self-portrait, invariably becomes larger than life. ‘Focus’ is a series of black-and-white portraits, printed on hanging cloths. The images are of bald persons whose genders seem indistinct and elusive; in fact they recall the image of the goddess of mercy, as with the effect of changes in focus, the clarity and distinctiveness of each image varies. The portraits are decorated with sewn thread balls and long flowing silken threads resembling human hair; some of them pleated into long braids that reach the floor. Lin Tianmiao combines calm, sombre bodies and images with cotton threads and balls, and through the use of light projection creates a mysterious, ritualistic mise-en-scene, which is also a signature feature of her style. In 2006, at the invitation of the Singapore Tyler Print Institute, Lin Tianmiao created her first series of works in print. These artworks, which are silk-screen prints transformed from her images or paintings, contain some of the common elements of her installation work. Some examples are uneven surfaces resembling swollen scars and winding, entangled threads. 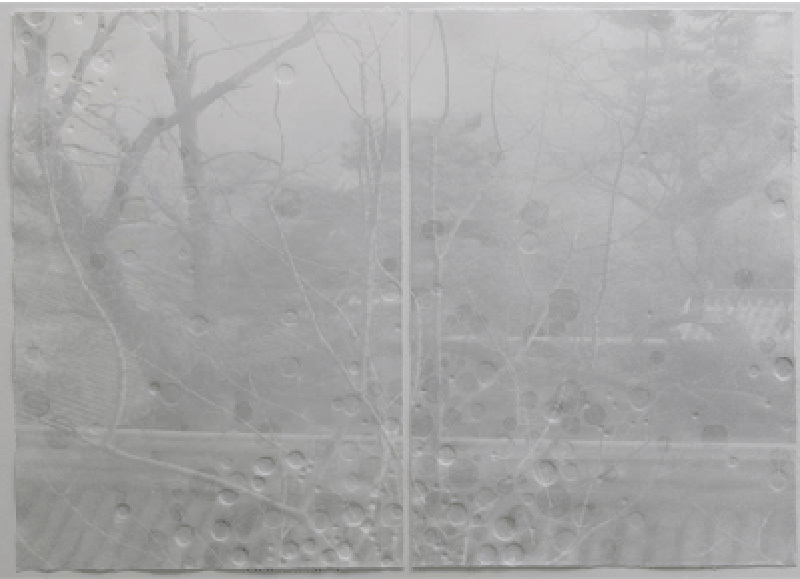 Lin Tianmiao’s favoured technique of creating gradual changes in the subtle tones of black, grey and white, by rendering subtle changes in atmosphere and creating different degrees of clarity through variations of focus, is reflected in this series of print as well. While print is generally considered a two-dimensional artform, she has dealt with it to create richly textured prints involving complex media – a testament to her artistic innovation and originality. Lin Tianmiao escalates the sizes of the portraits, as though the human figures have been elevated to the status of goddesses – although, those goddesses of hers hung up high, are actually the prototype of her prints. It may be said that these prints are the projections of the goddesses, and they are inseparable from her other previous work. Nevertheless, because prints are constrained by the size of the paper, they are, in terms of composition, like the segments of the images or paintings in her previous works. The fuzzy facial features of the images that have been enlarged in the process render the faces abstract; like fragments of Lin’s memory. Prints do not differ greatly from paintings, but to utilize the medium is indeed a choice befitting the multi-disciplinary nature of Lin’s work. In her twenty years of artistic endeavour, Lin has moved from design to painting, photography to sculpture and installation, and more recently, she has made a foray into the field of print-making. Her all-encompassing dynamism and creativity is proof of her steady rise into the pantheon of a female master artist.